Orange Grove is a flexible workspace located in Athens where young Greek and Dutch entrepreneurs can work on their business, network and learn. It offers young entrepreneurs the opportunity to start a business in a time when many young Greeks face the tough choice of whether to move abroad to avoid massive unemployment. It has welcomed 65 startups offering workspace, mentoring, seminars and access to a valuable network. This interview was carried out by Aliki Anagnosti, Co-founder of Yourtranslator, on behalf of the Academy of Entrepreneurship and was originally featured on the blog of Startup Nations. How and when did you come up with the idea to run Orange Grove and what were your objectives? Firstly, nowadays when new economic activity is needed, but large investments are rare, startups are the future. In Holland, 60% of new employment positions are created by small to medium-sized companies, younger than 5 years. Secondly, we think we have to give confidence to the youth, and untap the great creativity and energy of the current extremely well educated young generation. Between 2010 and 2012 125,000 young Greeks left for northern Europe. 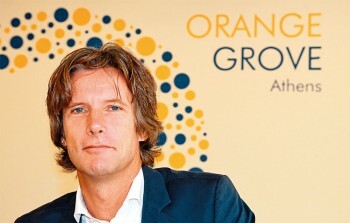 Orange Grove hopes to contribute a little bit to reversing this brain drain. Thirdly, working in a start-up company is a great learning experience. What were the main challenges you faced, what has been the progress so far and what are your plans for the future of Orange Grove? Orange Grove opened in September 2013 and has welcomed 64 startups in those past 15 months. Most startups stay between 6 to 12 months and receive, aside from a work spot and office amenities, our support through mentoring, coaching, networking opportunities and an education program. We have seen many business ideas grow into an actual company and the first batch of startups have successfully launched their own company. Many early stage startups struggle to raise pre-seed funding. The reduced savings of family and friends and limited ability of the banking system to provide credit, pose challenges for the entrepreneurs. To attract investor capital, startups have to be really well prepared, and make sure they have a very strong business model, and form a good, multidisciplinary team. We hope to be even more effective in supporting the startups to meet these challenges now that we have received a generous grant from the Stavros Niarchos Foundation. It enables Orange Grove to streamline its operations and enhance the quality of the services provided. Aside from bringing successful international startup founders and businessmen to Orange Grove as speakers and in-house residents, we organize a quarterly pitching competition called “The Squeeze’’ where the 2 best Orange Grove startups will be awarded with €15.000 and €10.000. Through these efforts we aim to support our startups even more and contribute to building an ecosystem. What are the main institutional obstacles faced by people who are trying to set up their own startup business in Greece? There is quite a budding startup ecosystem, but, especially since startups are a relatively recent phenomenon, there is still a number of things that can be improved to make Greece really attractive for startups. Creating the right legal environment and networking opportunities is essential. Compared to other European countries, Greece has quite complex laws and regulations for entrepreneurship. What would be your advice to other embassies in Greece and elsewhere? Should they be involved in similar initiatives? We have always said that we hope the idea is contagious. We hope others will copy it, because many more people could benefit from good entrepreneurship programmes and it would be great if Athens could become a hub in the international startup network. It does though require dedication and funding from various stakeholders and we have been fortunate to include companies as Heineken, Interamerican, Philips, , FrieslandCampina, ABN Amro, ING, Cocomat, Douwe Egberts etc. to our list of sponsors. Also the value of human capital, from both the Embassy and Orange Grove staff, as well as from mentors and coaches, is of great importance. On top of that, the grants from the great Greek philanthropic organizations Stavros Niarchos foundation, and Bodossaki foundation, really enable us to go the extra mile. Of course this would all not be possible without the support we receive from our knowledge partners: the Dutch Universities of Amsterdam, Delft and Wageningen, as well as the Athens University of Economics and Business. The importance of incubators as mechanisms for enhancing the economic and technological development has been acknowledged on a global level. Promoting promising entrepreneurial ideas and encouraging the growth of newly established companies can be a prime example of how business incubators worldwide can boost the local economy of the country and stimulate innovation. Especially in Greece nowadays, entrepreneurship can be the answer to the difficult financial situation and high unemployment rates by providing long term solutions. Moreover, the access to administrative support and reduction of early-stage operational costs, such as rent, service fees, etc., are typical critical barriers which many startups have difficulty in overcoming, indicating the added value of incubators during the startup phase of new ventures. When conditions like the above-mentioned are met, a center like Orange Grove can actually offer startups the opportunity to thrive.